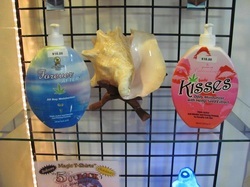 Our Accelerator lotions are an entry level lotion designed to get you color while keeping your skin moist. 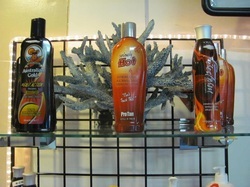 Keeping your skin moist while tanning is important, it allows the UV to penetrate your skin and go deeper. 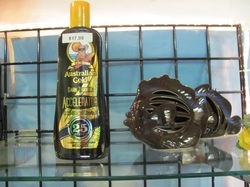 Bronzer's should not be confused with self-tanner's. Bronzer's actually make you brown unlike a self-tanner that makes you orange. 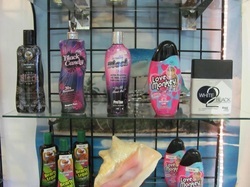 These lotion's also keep your skin moist while tanning and give you a nice brown, bronze color. Tingle's are designed for people who like instant gratification, but is NOT for everyone. Tingle is designed to bring your melanin to the surface of the skin at a faster rate. They open your pores and allows oxygen to flood into the pores thus pushing the melanin to the surface faster. Melanin is what gives our skin color. Tingle's can make you feel as though you have a sunburn, and do make you a red.